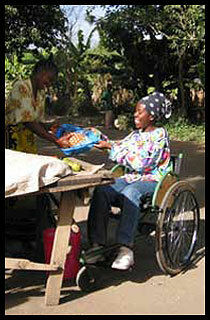 The technicians of MobilityCare have been making wheelchairs in Tanzania since 2003. Several development organisations helped set up the company. Despite starting with limited means MobilityCare has grown into a successful organisation. Today we work in a well-equipped workshop. Since 2005 MobilityCare operates as a fully self-supporting business. 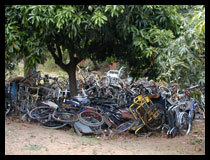 Importing wheelchairs can create problems.... there is a lack of back-up service and spares are often hard to obtain. Additionally, importing makes people dependent on donations and puts nothing into the local economy. In fact, it works against development. To overcome this, MobilityCare uses the capacity of local people, and locally available materials to provide a durable solution for disabled people in Africa. MobilityCare offers a range of thoroughly tested models to perform in the harsh African environment. All wheelchairs are made by local crafts people from locally available materials. It makes repairs easy and keeps the costs down.